The weekend we’re seeing an outbreak of anti-business or anti-capitalism protests breaking out all over the world as others take their lead from the ‘Occupy Wall Street’ protests in the US. Here’s Rupert Murdoch getting a bit of stick as he addresses a bunch of American fat cats about his plans to expand into the education business; given News Corporation’s current problems with the phone hacking scandal (and attached illegality) Rupert and impressionable youngsters is hardly a marriage made in heaven. And there’s a lot more of everywhere with rioters setting fire to cars in Rome tonight in a protest against, among other privations, the rampantly-corrupt Silvio Berlusconi, another media magnate of course. And even the Brits, currently mired in phone hacking inquiries, are starting to question the right of companies to influence government policy and legislation through the booming lobbying industry, an American invention. UK defence secretary Liam Fox has finally resigned over his friendship with one Adam Werritty, who seems to have been paid huge amounts as a ‘lobbyist’ by various defence-related companies (actually that should say ‘arms-related’) because of his ability to turn up for dinners and various other soirees with Fox, wherever he was in the world. Advertising, marketing and PR agencies are the willing handmaidens of big corporate and (sometimes) government clients, including banks of course, who have driven big parts of the Western economy to the brink of meltdown. And the people in these countries, or voters (these are mostly democracies of course) are fed up with it. 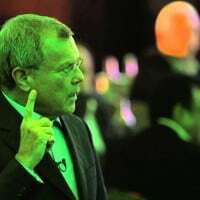 It’s surely time for the likes of Sir Martin Sorrell at WPP (who owns loads of lobbying businesses) and his marcoms peers to take a hard look at what they’re so eagerly up to. As of course should Rupert Murdoch. But I suspect it’s a bit late for that.